A rare visit to a convent that evokes a czarist Russian estate in this enchanted neighborhood of Jerusalem. The dream of a Russian princess glitters in front of us. The golden onion domes of the Gorny Convent, also known as Gornensky but better known to locals as the Moscovia, gleam in the sunlight. When viewed from the center of Ein Karem, a secluded ancient village in southwest Jerusalem, the domes stand out against the darker background of the pine and cypress trees of the hills behind. The dusty Middle East seems to vanish, in its place a snow globe with a model of the domed convent inside. Gorny is Russian for mountainous. 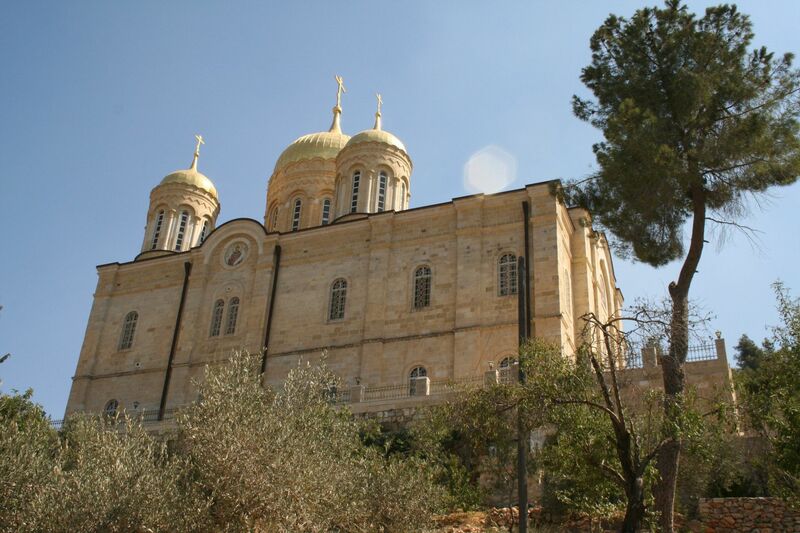 Ein Karem’s previous Arab inhabitants dubbed the convent al-Muscobia for its affiliation with the Russian Orthodox Church; in Hebrew, that became Moscovia. Our visit begins below, in the middle of the village, such as it is. The golden domes are high above us, distant and unattainable for the most part: The nuns rarely open their doors to non-pilgrims. But as part of this year’s Open House Jerusalem, one of many such events held around the world, earlier this month the Gorny Convent was opened to the public. Access to the convent is through the hospital parking lot, oddly enough. Once past the convent’s green iron gate, I look around in wonder. I seem to be in the middle of a large Russian village, filled with dozens of small homes surrounded by gardens and connected by paths. Next to many of the houses are covered cisterns or rain barrels, with downspouts that conduct rain water from the roofs. Jerusalem, Hadassah Hospital, Ein Karem’s traffic jams all disappear when the gates close behind us. There is total silence and the aroma of the flowering white jasmine. We slowly ascend the paths to the convent itself. Gornensky Convent was founded 140 years ago. The key figure, Ein-Mor relates enthusiastically, was Grand Duchess Elisabeth Feodorovna of Russia. Born Princess Elisabeth of Hesse and by Rhine, the German royal was the granddaughter of Queen Victoria. She grew up to marry Grand Duke Sergei Alexandrovich of Russia, the Czar’s brother and the namesake of downtown Jerusalem’s Sergei Courtyard, near the Russian Compound. Elisabeth, who was considered one of Europe’s most beautiful and desirable women at the time, yielded to Sergei’s wooing only after long hesitation. 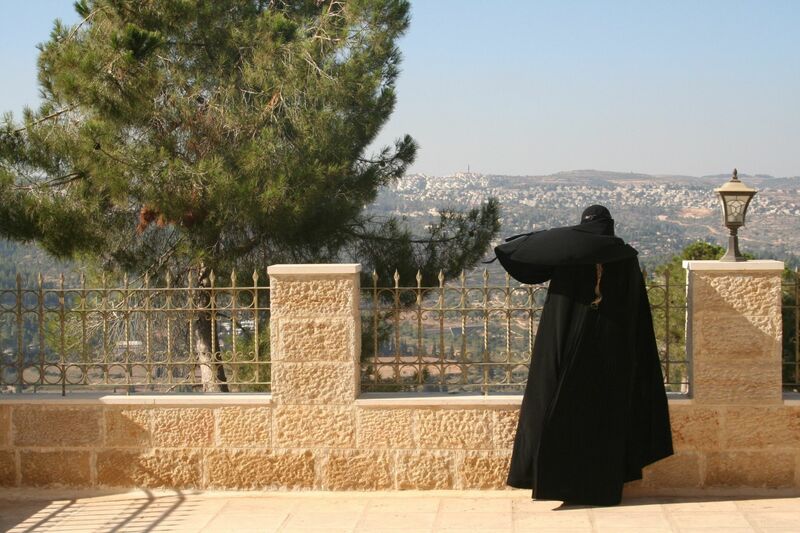 Toward the end of the 19th century she came on pilgrimage to the Holy Land, and in 1888 she and her husband attended the dedication of the Church of St. Mary Magdalene on the Mount of Olives, which they helped build. Grand Duchess Elisabeth fell in love with Ein Karem. She asked that a church be built there and that she be buried at the Church of St. Mary Magdalene on the Mount of Olives when she died. In 1920, two years after her death, she was interred there. 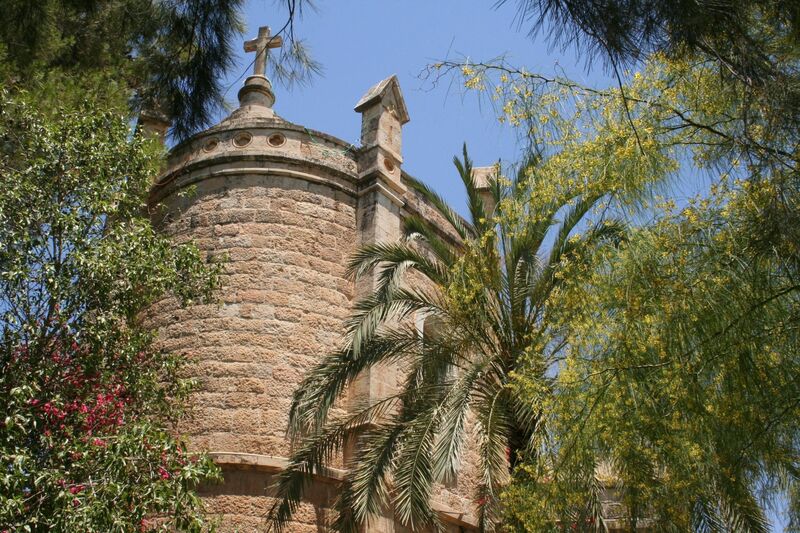 The Russian Orthodox church that was built in Ein Karem at her request remained without a roof for 100 years. It was only completed in 2004, when then-Prime Minister Ariel Sharon acceded to Russian requests and allowed the work to be done. It was then that the golden onion domes were placed on the roof. The Moscovia compound contains two churches. The larger, domed one, which for years was known as “the unfinished,” for obvious reasons, is the Church of the Holy Trinity. Although it is grand, with dozens of golden icons, the smaller one, commemorating Mary’s visit to Ein Karem, is far prettier. To reach it we descend several staircases, among pomegranate trees heavy with red fruit. Black-garbed nuns and pilgrims in street dress peek at us from the houses of the village. We could be on a Russian estate in a Tolstoy novel, I think to myself. 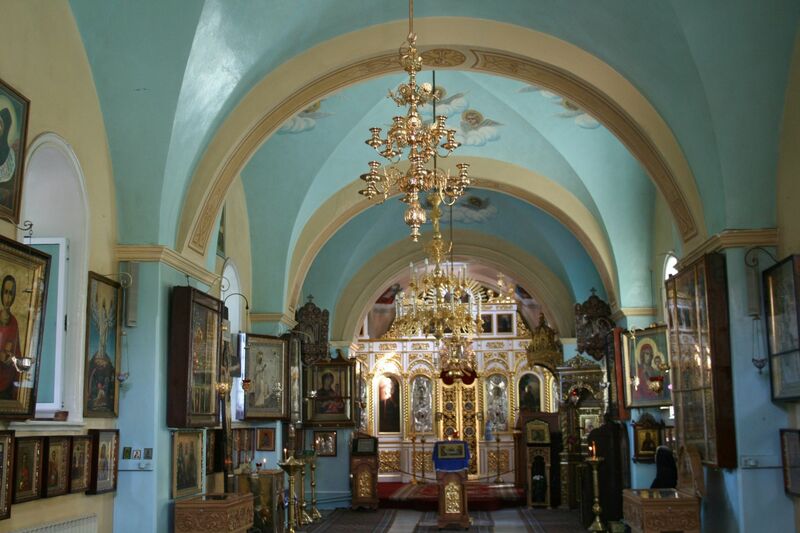 The walls of the smaller church are a light blue. There are numerous depictions of Mary and Elizabeth embracing each other. The two women have become a symbol of Ein Karem and its main attraction for millions of pilgrims from around the world. The convent has 60 nuns at present. They live in some of the small homes we saw, while others accommodate pilgrims. On the day we visited they prayed in the larger church at 4 P.M. A priest, one of the few males in the compound, led the prayers. A choir of clear-voiced nuns chimed in. In fact, there are three churches, the last concealed in a cave. The nuns say it is the birth place of John the Baptist. In the Eastern Orthodox Church of St. John the Baptist, also called St. John in the Mountains, is another cave that by some traditions was the birth place. 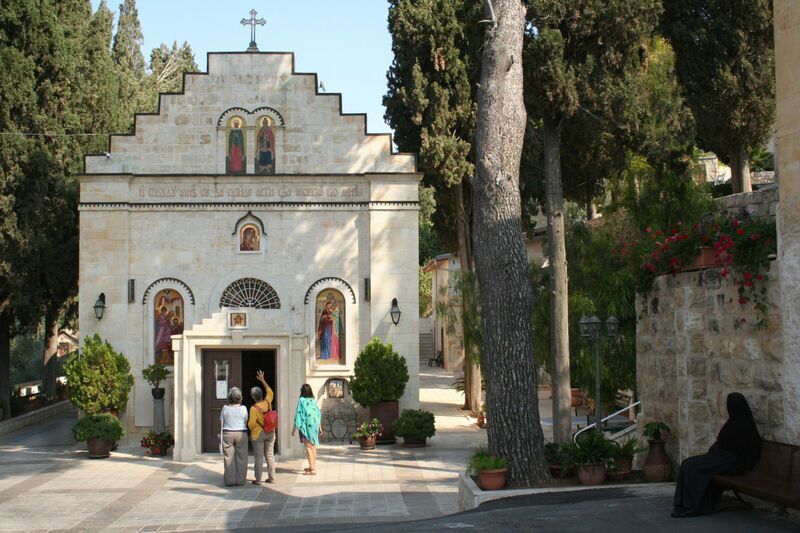 Ein Karem is home to six pilgrimage sites in addition to the Gorny Convent: the aforementioned Church of St. John the Baptist; the Sisters of Sion Convent; the Greek Church, the St. Vincent Monastery, now a home for children with head injuries; the Rosary Sisters Convent and the Church of the Visitation. Ein-Mor adds with a smile that Ein Karem also is home to eight synagogues. Stairs take you from the center of Ein Karem, under a large gate, to the Franciscan Catholic Church of St. John the Baptist, a Crusader-built structure. In 2004 a mikveh dating to the Second Temple period was found there, indicating that Jews lived there at the time. On the southern wall hangs a 17th-century painting attributed to the Spanish painter Francisco Ribalta and depicting the beheading of John. I look at it and recall a sentence from Gustave Flaubert’s “Herodias” (a retelling of John’s beheading), which Haaretz writer and editor Benny Ziffer, a translator of French literature, has called the most beautiful sentence in the French language. In it, Flaubert describes the carrying of John’s severed head through the desert: “Since it was heavy it was carried first by one person and then by another.” There, in the church, across from the painting and above a cave proclaimed to be his birthplace, this sentence felt as tangible as could be. Sister Anne, a diminutive nun in her 60s, gave us a rather flustered smile. She proudly shows us the well-tended garden of the convent, Sister Anne was born in France and has lived here for the last 44 years. Fifteen nuns live in the wonderful stone structure, built in 1861. They have come from seven countries and speak seven different languages. The nun then tells us of the guest house they run. The location serves as an interesting meeting place for Jews and Arabs, Christians and Muslims. There are events and concerts, and many writers come for some isolation and undisturbed time. The scenery seen from here is different than the one seen from the Moscovia. The silence in the compounds and gardens is remarkably similar. In July 1948, some of Ein Karem’s Arab residents were expelled and others abandoned the village. The village is one of the few in the area that was not flattened. After Israel’s War of Independence, Jews were brought to live in the old Arab homes of this unique Jerusalem neighborhood. Ein-Mor says that now that preschools have been opened in the neighborhood it is becoming more popular with young families. After our tour we sit at a tiny café in the center of the village called Real Things, where we eat small portions of heavenly tasting frozen yogurt with fruit. We then drink iced coffee and pomegranate juice, and suddenly I have an epiphany and everything seems clear and simple. Later we buy a dozen divine truffles at an adjacent chocolate shop. Redemption is nearly upon us.